Hi! I’m Lisa Danielson, head nutritionist here at IdealRaw and an ISSA Specialist in Fitness Nutrition. I’m also a certified personal trainer and help people every day achieve their fitness goals through exercise and diet. I love what I do and know the power that comes from clean eating. As a lifelong vegetarian, I’m all about my fruits and veggies. I totally know how expensive it can be to buy organic and quality produce, though. With IdealRaw Organic Superfood, you not only get those quality fruits and vegetables, you also get essential nutrition from 28 different sources. IdealRaw Organic Superfood is made from USDA-certified organic ingredients, like flax seed, green tea extract, beets, apples, and even shiitake mushrooms, that provide you with vitamins and minerals that keep your body healthy. And with zero grams of fat and 6g of protein per serving, whatever you mix IdealRaw Organic Superfood powder with will get a super boost of the nutrition your body needs. Life’s busy. We totally get it. With all the things you have to get done in a day, making a proper meal just doesn’t fit into the schedule sometimes. There must be a way to continue to eat healthy, while you take life head on, though, right? Cue dramatic entrance of IdealRaw Organic Superfood. 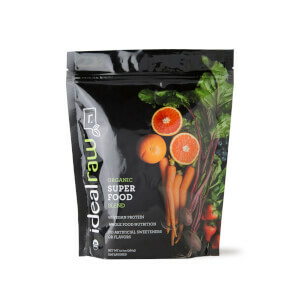 IdealRaw Organic Superfood is nature’s favorite little superhero. It will save you time, money, and give you the energy and nutrition to keep you working at your best. Save on Organic Superfood Today! How many servings are in a pouch of IdealRaw Organic Superfood? Why would I take IdealRaw Organic Superfood? IdealRaw Organic Superfood powder is an easy, convenient way to get important vitamins and minerals your body needs. What do I mix this in? You can mix this with water and drink alone, or you can add this to your IdealRaw Protein shake to up the amount of nutrients and vitamins you are getting in your diet. This product is USDA organic certified, non GMO verified, and gluten free. 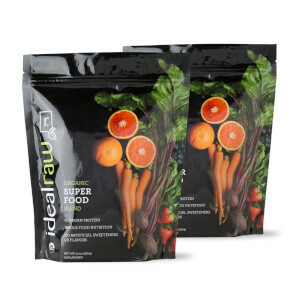 The IdealRaw Organic Superfood has a very neutral taste but is best when added to IdealRaw Protein. Does this product have protein in it? 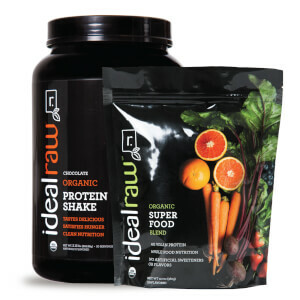 Yes, IdealRaw Organic Superfood includes 6g of protein. The protein sources are from organic pea protein and organic hemp protein. Why does it have seeds in it? Those are chia seeds. Chia seeds are packed with great nutrients and fiber. What are the allergens I should worry about? NONE of the 8 major allergens are present in our product. It is, however, processed in the same facility as coconuts (tree nuts).